The RCM Scholarship Program began in 2009 and since then we’ve touched the lives of 55 students and we boast 18 graduates. Our scholarship program has an important and unique feature. 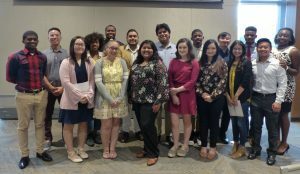 In addition to the scholarship, two Rotarians are assigned as mentors to each scholar and provide academic guidance, coaching and career advice to the students. Funding for our scholarship program comes from two primary sources. The Scholarship Golf Classic funds almost 70% percent of our scholarships. The remaining funds come from our growing number of named scholarships. In August an anonymous donor created a scholarship to honor a beloved teacher, Mrs. Kara Lovell. Mrs. Lovell began her teaching career with Milwaukee Public Schools in 1970. She believes that all children can learn given appropriate resources, good teaching methodology and the recognition that racism and poverty cannot keep a person with great determination from achieving. She helped students, especially African American students, understand that the heritage of African American people is something of which they can be proud. She treated her students as if they were her own children. The Kara E. Lovell Scholarship will be awarded to a MPS graduate who intends to become a teacher. In addition to the Kara E. Lovell Scholarship, we have the Bill Adams Scholarship, Jim and Judy Ford Scholarship, James I. Miller III Scholarship, and the Gordon and Elizabeth Smith Scholarship. Coming in 2019, the Michael Barber and Jackie Herd-Barber endowed scholarship fund will support an African American graduate of MPS who intends to pursue a career in science, technology engineering or math. Thanks to all of our very generous donors! Does a named scholarship fit your charitable giving? An estate plan gift combined with annual giving can create a “virtual legacy fund”. For example, if a donor includes a $100,000 gift in an estate plan and commits to an annual gift of $4,500, giving in the name of the donor can begin immediately. Donors may pledge to build the corpus of a fund over a number of years while also making a gift used for immediate giving. Example: A donor pledges $12,250 a year for five years. Each year’s gift is divided into two parts: $2,500 is used for an annual scholarship and $10,000 is placed in the endowed fund. The scholarship is funded by the endowment in year six. For information, please contact the Rotary office. Scholars at our August 14th luncheon.